Increasing the amount of group work in school is unhelpful. It’s a sentiment I’ve heard frequently as of late. Professors frequently favor group projects and papers over more traditional individual assignments, a trend reflective of larger changes in corporate culture and an increased emphasis on the importance of teamwork, communication and the circulation of ideas and bodies in shared business spaces. Companies such as Apple and Google, whose headquarters are designed to look like universities, are adopting the physical and organizational features of universities; campuses, universities like Dartmouth are emulating the same structures of discourse companies supposedly use to generate ideas for new products. This is a reciprocation we often accept as natural, and by extension good. We should look at this trend more closely. For companies, there is nothing natural about living at your place of employment, having transportation, food and entertainment provided to you by your employer or being forced to do arduous team-building exercises designed to increase chemistry among a group of co-workers. Yet companies like Apple build cultures in the image of the American university for a purpose: They want to capitalize on their employees’ creativity to one day generate billions in revenue. For businesses, imitating universities, where students spend their days studying innovative ideas, makes sense. Mimicry in the reverse direction — that is, of universities-emulating-businesses — does not. 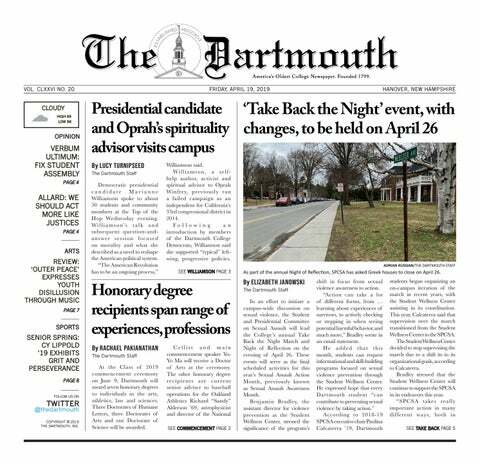 The university experience, especially at colleges with liberal arts curriculums like Dartmouth, is its own unique creation. To quote a professor I heard speak during Orientation: “A liberal arts education is what you remember after you forget what you learned at college.” We study seemingly disparate subjects, grappling with their complexity and trying to make sense of them. As students, we are given four years to grow intellectually, socially and emotionally at a faster rate than perhaps any other time in our lives — this is what companies try to capitalize on when build-ing campuses. But we cannot build this intellectual growth by imitating companies. Good academia is sensitive to that which lays outside of it. Furthermore, good teaching can and should include group work. However, assigning multiple group projects under the justification that “this is how it’s done in the real world” is shortsighted. Doing so neglects the often-forgotten importance of solitude. By solitude, I don’t mean being alone but choosing to be alone to engage with your subsequent thoughts and feelings. There is a difference. Often times, when we are alone, we do not sit with it. We whip out our phones. We choose to avoid engaging with solitude, which is a necessary condition for proper intellectual and emotional growth. The value of this engagement with oneself — made possible only through hours spent in solitude — has been echoed by great minds throughout time, from Steve Wozniak and Ingmar Bergman, to Henry David Thoreau and Friedrich Nietzsche. In fact, without Wozniak, who spent hours in solitutde to create the personal computer, Apple could not exist as it currently does or employ the practices of groupthink and intellectual sharing we associate with it. In the same way that great books — contrary to popular belief — are not written by drugs, eccentric crowds or passionate lovers, great things are not invented solely by a cohesive group. Great things are invented by individual actors who think long and hard, just as great books are written by active, precise minds who have ample time to write and re-write. All great human creations take shape inside the mind. As good as it feels to communicate with others — we are social creatures after all — to understand something well enough to put forth our own ideas of it, you must take time to reflect and synthesize. For that, you must disengage with the larger world. Again, the difference between solitude and “being alone” cannot be overstated. As a society, we are engaging in acts of solitude less and less. We are simultaneously more alone than ever before. This loneliness concerns me the most. Yes, an increase in group work at colleges as a result of imitating successful business culture is bad. In seeking to emulate businesses, colleges neglect how important solitude is to businesses’ success. But it is this loss of solitude in our society at large, of which an increasing amount of group work is a symptom, that has larger and more dangerous implications. The push to be more connected via social media has paradoxically led young people to report increased feelings of loneliness. Multiple studies have found that too much time spent on social media can lead to feelings of loneliness and envy at the prospect that so many others are living better, happier lives. Additionally, when we engage with social media, we stop engaging with ourselves via traditional acts of solitude. We distract ourselves from ourselves. What’s worse, we actively produce representations of ourselves that separate us from what we are really thinking, really feeling. Take Instagram, for example. When we post, we produce an image that rarely expresses anything more than a polished façade. That polished image is then consumed by followers, all of whom are part of this economy of images. This economy is fundamentally capitalist, where likes are the capital. To borrow a metaphor from Karl Marx: In an ideal society, where individual actors produce as humans rather than things, “[o]ur products would be so many mirrors in which we saw reflected our essential nature.” Marx is traditionally thought of as criticizing the assembly line, but this metaphor can also be applied to how we preform our identities online today. Instagram posts, which we might like to think of as expressing our true selves, only reflect a thin sliver of the spectrum of human experience: The sun-drenched, latte-loving, Halloween-costume-wearing sliver. We are told that we can do whatever we want on our social media pages, but social taboos governing what we can and cannot post prevent us from engaging with each other online as fully formed humans and encourage us to engage with each other as disparate, two-dimension avatars, always becoming further alienated from our fully-formed selves. This alienation fosters loneliness, which causes us to spend more time “trying to feel connected” — and the cycle continues. As difficult as it may be and as paradoxical as it may seem, we must remember the importance of solitude when confronting loneliness. Allowing ourselves to disengage with the fast-paced, social media-heavy, teamwork-loving world we find ourselves in and choosing instead to stare out the window, to go for a walk, to pleasure read or to write down our thoughts, may be difficult, weird or frowned upon, but it is entirely worth doing — if for nothing else than to reclaim a part of ourselves surreptitiously eroding away.